Canberra Tour is on Saturday, 27 October 2018. Cost is $40 per seat. Treasurer is accepting payments now. Phone 9622 8309. ANZ Blacktown NSW - and add you name for ID. For the latest Society News click on the link below to download the pdf file. The next General Meeting of the Society will be held on Monday, 5th November 2018. Visitors are always welcome. We hope to see you there! Diggers from the Shire of Blacktown 1914-1918 is now available for purchase. 300 copies were donated to Blacktown schools before ANZAC Day 2015 as part of the Centenary of World War One Commemorations. Blacktown and District Historical Society was founded in 1976, to ensure that the history of the Blacktown area would be collected and conserved for all time by tapping into documents and people's memories. You are welcome to visit our Research Centre, open Tuesdays 10.00 am to 2.00pm, or by appointment. So many events in our local and national history occurred in this area and these must not be forgotten. The department of Agriculture bought 58 acres (26ha) in 1923 to research many aspects of the poultry industry and Seven Hills was seen as the centre for pioneering poultry production around Sydney. In addition to collecting and recording Blacktown's history, our members also carry out research and assist other people to use our newly-opened research facilities. A new suburb, to be named Bungarribee, is emerging from the grasslands of the Western Sydney Parklands at Doonside. Controversially, the suburb will surround the highly sensitive remains of the house and outbuildings of the colonial property known as Bungarribee. 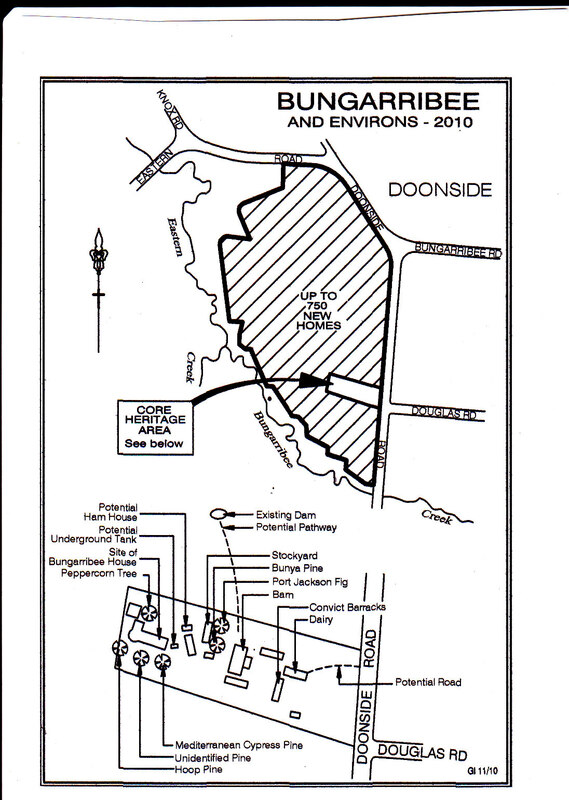 IN 2004 THE then Minister for Western Sydney, Diane Beamer MP, initiated a state government project that reclaimed certain lands zoned as public parkland by rezoning them for residential and industrial purposes. The first of these projects, apparently for the greater good, involved the Bungarribee Precinct of 300 hectares at Doonside. Some 80 hectares of the Bungarribee Precinct have been earmarked for a new housing estate which will be host to up to 750 homes designed to satisfy a range of potential buyers. Click here to see map. A focus and key landmark for the new community. The third factor has a "clutching at straws to provide a third factor" quality to it, the writer feels. The first two refer to the presence of a mature Bunya pine tree standing near the site of Bungarribee House and assumes it to be an early planting. This may be so, but the proposal to name the suburb Bunya (a tree native to Queensland) found little favour with historians. Members of our Society, the Prospect Heritage Trust, Mount Druitt Historical Society and the Friends of St Bartholomew's attended a meeting convened by Landcom in September this year and held at Blacktown Library. Landcom staff were joined by representatives from Clouston Associates, MBWA Consulting, APP Corporation, Godden Mackay Logan and the NSW Heritage Office. On the topic of the proposed new suburb name it was politely pointed out that Bungarribee was surely a name of greater historical merit than Bunya for the simple reason that the housing estate was to be located on the former Bungarribee property and actually surround the sites of Bungarribee House and its outbuildings. Landcom's representatives stated that use of Bungarribee had been resisted because it was considered unwieldy and difficult to pronounce. Pemulwuy, however, was cited by one historian as an example of a 'difficult' name that has been recently applied to the new suburb between Prospect and Greystanes and successfully adopted by the locals. Early in 2011 Landcom is expected to lodge a new application with Blacktown Council that will propose Bungarribee as the suburb name in lieu of Bunya. As a solution to the problem of protecting the highly significant archaeological remains of Bungarribee House and outbuildings within an urban setting, a public reserve is to be established around them. This "core heritage area" park appears to be Landcom's only option under the circumstances. Click here to see map. In a tribute to the history of Bungarribee as a bloodstock stud, the streets of the first two of the five stages of housing are to be named after racehorses bred on site. When considering new road names it must be borne in mind that residents will have to live with these names for a considerable time. Consequently, horses whose names are unlikely to be honoured include Problem, Fairy and Silvertail. Thomas Icely, who purchased Bungarribee in 1827 and established its thoroughbred breeding reputation will also be included in the naming process. If you enjoyed reading this article, why not become a member and receive our regular and informative newsletters, as well as other great membership benefits.